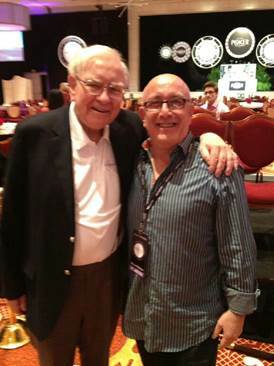 Former NCPT founding member and frequent guest, my close friend and business partner, Bruce Yablon, just finished in 2nd Place out of 230 people at Warren Buffet’s Net Jets Poker Tournament out in Vegas. In doing so, he just won a $100k donation from Net Jets to a charity of his choice. Congratulations Bruce on a tremendous showing. I think given your NCPT history, should consider on giving 20% of donation to a charity of NCPT choosing….thinking Gamblers or Squitter’s Anonymous. Here is a picture of Bruce with Warren!! Just awesome.